On 8th of January, 2018 3rd meeting of the Council for Trade Development and Promotion has happened under the chairmanship Union Minister for Commerce and Industry (Shri Suresh Prabhu) in New Delhi. What is Council for Trade Development and Promotion? What is the composition in Council for Trade Development and Promotion? What are the objectives/purpose of Council for Trade Development and Promotion? On July 3, 2015, the then Minister of State for Commerce and Industry Nirmala Sitharaman had constituted the Council for Trade Development under the chairpersonship of the Union Minister for Commerce and Industry, in pursuance to the provisions of Foreign Trade Policy statement 2015-20. 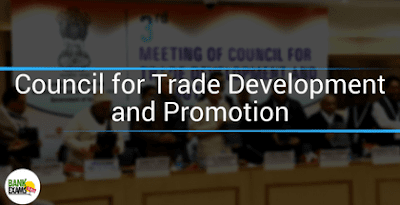 What is the composition of Council for Trade Development and Promotion? Heads of other export-related organizations/trade bodies are Members of the Council. It also helps to prepare state governments to deal with an evolving situation in exports and imports. Providing the platform to State Governments and Union Territories for articulating their perspectives on trade policy. Suresh Prabhu released a study “LEADS-Logistics Ease Across the Different States” which is a first-ever sub-national logistics performance index. He also released the “State Exports Booklet” which is a compendium, of the status of exports from the States over the last 10 years. Also discuss various issues including falling exports to the ASEAN, ahead of the visit of state heads of 10 ASEAN countries, who will be present in the country to participate in the Republic Day function. 1. Who among the following act as chairman of Council for Trade Development and promotion? 2. In which year Council for Trade Development and promotion was formed? 3. Which state ranks first in LEADS-Logistics Ease Across Different States that is released during rd meeting of CTDP? 4. Which union territory ranks first in LEADS-Logistics Ease Across Different States?